Hi, my name is Cole. 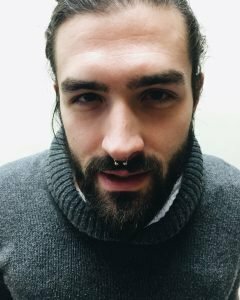 I am excited to share my experience as a training piercing technician with you. I have wanted to be a body piercer since I was 14. Learning about the industry really intrigued me, and now that it’s finally happening, and it’s my turn to learn to pierce, I decided to share my journey through this blog. Just so you know a little about me, I grew up in the suburbs of Minneapolis. In my free time, I enjoy being with my friends and family, learning more about the industry I work in and love, playing video games, practicing mindfulness, and working to better myself as a person! After I moved out on my own, I decided to try and become a body piercing professional. I was thrilled to get a job working the counter at Almost Famous Body Piercing at our Northeast Minneapolis location. At Almost Famous Body Piercing, our training is a little different than most. Once I was hired, I started working the front counter. Once I had a good understanding of jewelry and possible jewelry styles and sizes for new piercings, I got to start technician training with a week at Piercing Central. There, I learned the process of disinfecting, cleaning, and sterilizing tools and jewelry with proper equipment, laws and ordinances for the state/city, how to mark and set up for all piercings, the basics of human anatomy, all about the tools and what each tool is used for, and how to properly hold and use each tool. This week includes informational slide shows and videos, as well as a lot of hands on practice. Before I could qualify to attend Piercing Central and become a Piercing Technician, I needed certification in both blood borne pathogens and CPR/Frist aid. It’s important to become familiar with how pathogens are spread, and ways to prevent this from happening in the piercing room. It’s also very important for me, as the technician, to learn how to care for someone who may faint or not feel well during the piercing process. Once I received my blood borne pathogens and CPR/Frist Aid Certificates, I got my State of Minnesota Temporary Body Art Technician license. Once my license arrived, my supervisor schedule the date for my Piercing Central training, and my adventure started!! Piercing Central is one of the best weeks I’ve experience yet because it is the beginning of my piercing career. The start of everything I’ve worked hard for. The class itself leads up to the workshop day, where friends, family, and people from the community are invited to come and get pierced after that week of hard, focused work. The dates and times are posted for each Piercing Central workshop in both our Fargo and Minneapolis training centers at Piercing Central. The dates are posted about two weeks in advance. We hope to see you at our next workshop! The night before my workshop I was beyond excited. I couldn’t believe that after all these years of dreaming of becoming a body piercer that it was finally coming true! I barely slept that night because of the excitement! The next day, I woke up with the biggest smile on my face. As I started to approach the Piercing Central location, my nerves kicked in. The first piercing I had that day was a septum. 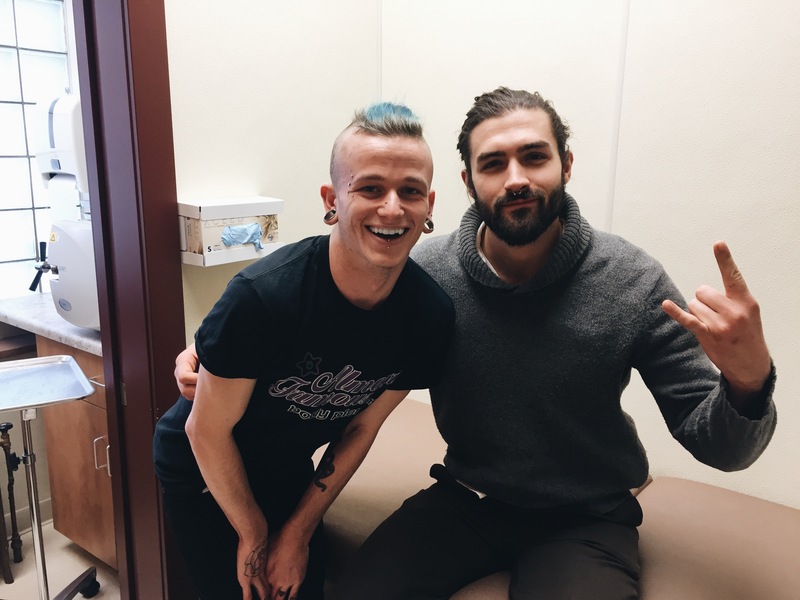 My friend, Cody, brought his friend, Ben, to get his septum piercing done. Ben had wanted this specific piercing for some time, and he decided he wanted me to do it for him. I was so honored that he was willing to help out with my learning experience, but I was also very nervous that the piercing wouldn’t turn out right. After I shared with my supervisor how nervous I was, she gave me a little pep talk and told me it would turn out amazing. She reassured me she would be right next to me the whole time, and would answer any questions I had. As I lined up my receiving tube and set my needle, the adrenaline kicked in. I asked my Ben to take a deep breath in and a long breath out. I pushed the needle through his septum, and instantly started smiling. After I put the jewelry in that very first piercing and cleaned off the area, I had Ben take a look in the mirror to see if he liked the way it turned out. He checked in the mirror, and then looked back at me and smiled and said he loved it. The septum turned out so even and straight, I couldn’t believe I just did it! That piercing set the mood for the whole day. As more of my friends came in to get pierced, the less nervous and more excited I became. By the end of my workshop, I had done 22 piercings and they all turned out just how I wanted them to. After I had scrubbed and cleaned all the tools and cleaned the room I was exhausted and ready for bed. 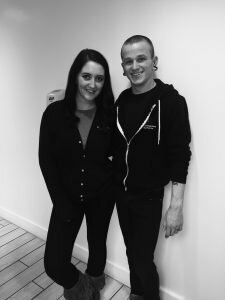 Once I completed my week at Piercing Central, I started piercing with supervision in one of our Almost Famous Body Piercing locations. Going from piercing just friends to the public is a bit nerve racking, but my supervisor is always right there in the room with me. One of the things I really love about Almost Famous is that I get to work with amazing senior piercers who have been piercing for years and have done thousands of piercings themselves. 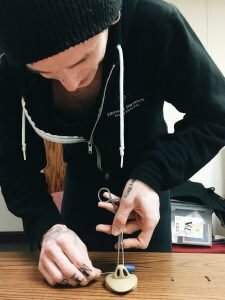 I get to learn each individual supervisor’s personal piercing technique, and apply what I learn to my own piercing method. You can follow me on my piercing journey with more blog posts to come!